College students today are increasingly different from those of previous generations. They are less likely to be white and more likely to be the first in their families to go to college. Professors who would like to guide these first-generation college students in adjusting to higher education may come across their own challenges. Communicating with people from different cultural backgrounds can become a barrier unto itself. 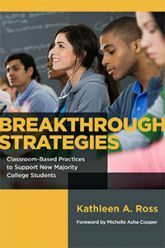 In her new book, Breakthrough Strategies: Classroom-Based Practices to Support New Majority Students (Harvard Education Press), Sister Kathleen Ross, director of the Institute of Student Identity and Success at Heritage University and founding president of the university, outlines various approaches for professors to connect with and teach first-generation, underrepresented students — or “new majority students,” as Ross calls them.